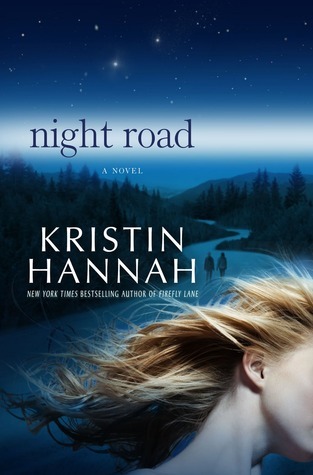 Yesterday at lunch I started reading Night Road by Kristin Hannah. When I got home from work I picked it back up and finished it at 12:30 am this morning. I'm usually not a fast reader but I could.not.put.it.down. I also have puffy eyes this morning from crying through the second half of the book. Jude does everything to keep her kids safe and on track for college. It has always been easy-- until senior year of high school. Suddenly she is at a loss. Nothing feels safe anymore; every time her kids leave the house, she worries about them. NIGHT ROAD is vivid, emotionally complex novel that raises profound questions about motherhood, identity, love, and forgiveness. It is a luminous, heartbreaking novel that captures both the exquisite pain of loss and the stunning power of hope. This is Kristin Hannah at her very best, telling an unforgettable story about the longing for family, the resilience of the human heart, and the courage it takes to forgive the people we love. I felt so connected to the mom in the beginning of this story. As a mom of a high school student who just got her driver's license. She's already called me crying that she got in a car accident. We live at the end of a long country road where people have died from making a slight mistake. It's all so real. The 2nd half of the book is something that I'd never ever ever want to have to think about feeling. It did make me think of my neighbor who's daughter died when she was about 19 or 20 on one of those long country roads. She was drunk, in the truck with her boyfriend, who was also drunk. They hit a tree going about 100 miles an hour. She died instantly and he was airlifted and died not too long after. The mother, my neighbor, never went back to work. This book gave me quite the insight on what she was most likely going through. This is a really good book, but if you've lost someone in a car accident and/or a child, it's probably not the book for you. I've been working my way through the Kristin Hannah books. I can't believe I didn't blog about the Winter Garden, by far the best book I've read in a really long time. I listened to True Colors on an audio book. I'm not sure if it lost something in the audio book format, but I didn't like it nearly as much as the other two books I've read. I read Firefly Lane and don't remember much about it. I must have liked it though since I rated it with 4 stars (out of 5). It was two years ago that I read it so that could be part of why I don't remember it much. I'm almost thinking I should re-read it. Have you read any of Kristin Hannah's books? Firefly lane was about the two girls that met (on Firefly Lane) then it followed them thru their lives. Can't remember their names but one of them became a big fancy news anchor and the other one a mom. Remember now? I read it on your suggestion. I liked it. I am reading "Three Cups of Tea" right now by Greg Mortenson and I forget the other guy. It's about a guy (Greg) who goes to climb K2 then ends up in a Pakistani village w/o a school and promises to come back and build them a school. Really good so far, but not a fast read. Lots of big descriptive words so not easy to skim thru. I just read this one too...very moving....I cried too! I haven't yet, but I keep meaning too. Question for you though ~ does she use any of the same characters or can you read them in random order? Not sure if I want to read Night Road after reading your review though.. still tough after losing Nate's birthmom in a car accident several years ago.